Welcome to week four, and the first square from Steel & Stitch, the fabulous Emma Friedlander-Collins! Using the skills and stitches you’ve learned so far, this week you will be making the Stocking Stitch Square using the Hump Stitch! As well as Emma’s video below, she’s also written a tutorial on how to work the Hump Stitch to help you get started. If you’ve just joined us, the Crochet Girl Gang CAL blanket is made up of five gorgeous motifs inside granny square and triangle shapes, which are then joined to form the final blanket. For a little bit of background and how to get involved you might want to start off here. You can also find Part One of the CAL here, Part Two of the CAL here, and Part Three of the CAL here for reference. Meet the Stocking Stitch Square, designed by Emma Friedlander-Collins from Steel & Stitch. Below you’ll find a video tutorial and a written tutorial, and downloadable PDFs below. You will need: Colour D and your border colour as well as a 5mm crochet hook. When you work a htr there is a 3rd loop that sits at the back of the stitch. Working into this stitch only (also known as the hump stitch) creates a knitting style, stocking stitch. Fasten off at the end of each row, join on in corner space for start of next row. Round 1: ch2, 3htr into the loop, ch2, *4htr into the loop, ch2* rpt 3 times, ss in beginning ch3. Fasten off and join on in corner space for start of next row. Round 2: ch5, htr in same ch sp *in hump stitch htr 4, in the corner ch sp (htr, ch2, htr)* rpt to end, ss into beginning ch3. Fasten off and join on in corner space for start of next row. Round 3: ch5, htr in same ch sp *in hump stitch htr 6, in the corner ch sp (htr, ch2, htr)* rpt to end, ss into beginning ch3. Fasten off and join on in corner space for start of next row. Round 4: ch5, 2tr in same ch sp *in hump stitch tr 8, in the corner ch sp (2tr, ch2, 2tr)* rpt to end, tr and ss into beginning ch3. (12 stitches across each side of the square plus two chains in each corner.) Fasten off and join on in corner space for start of next row. Round 9. Join border colour into any corner, ch3, (1tr, 2ch, 2tr) in same place, 1tr in each st working (2tr, 2ch, 2tr) into each corner space, join with ss to top of beginning ch3. Have you completed part 4? Click below to the rest of the CAL! This CAL is all about sharing the love so we want to see your progress and plenty of encouraging comments. You can share your updates and photos on Instagram using #crochetgirlgangCAL and #crochetgirlgang! 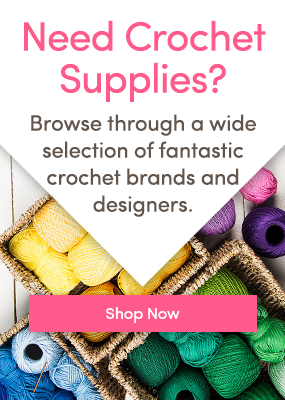 You can also join us for CAL chit chat on our Facebook CALs page, plus you can upload your projects to the Community using the HotTag CrochetGirlGang by simply clicking on the image below! I seem to be having trouble watching the video this week. Any ideas? Am hugely enjoying the CAL so far and am a keen to get on with week 4. We’re fixing the video as fast as we can – it won’t be much longer! Hope you enjoy the stocking stitch square – it’s a lovely stitch to learn! Thanks, the video is now working and the square looks really interesting. The video is listed as private, and so we can’t view. Am also enjoying the CAL, but this weeks is tricky, so the video would really help!! Hi Georgia! So sorry we’re just correcting the video – it’ll be live very soon! I hope you enjoy the stocking stitch square! Once you get the hang of it, you’ll love it! I will be watching the video very closely this week. The square looks lovely. Rounds 2 to 4 are all worked in the same way- the chain 5 represents one stitch and the chain two, meaning that you work the final stitch into the same corner space and join. This is a little different to the previous squares (and round 5 onwards of this square), where the corner 2 stitches, chain 2, 2 stitches are all worked at the start of the row. This is because of the hump stitch, and helps to keep the tension even. I really hate this square. I used scrap yarn to practice and finally got it right. I made several just to be sure i had it right. Even after I got it right, but I realized that I don’t even like how it looks and it is such a pain. So I am going to use the circle square pattern instead. I think that if I made 5 squares that I dislike that much, then I would hate the finished blanket. I was not able to accomplish this stitch. As an alternative, I just did 3 rows of hdc, then the row of doubles. Still turned out very nice and keeps that row with its own design. There’s no set tension for the squares, but perhaps you can block the smaller squares out so that they match the size of your other squares?